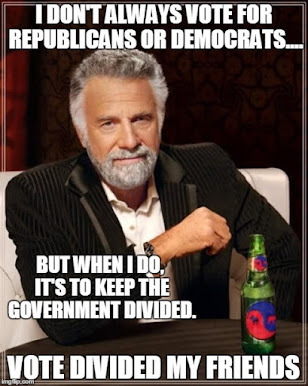 The Dividist Papers: 2010 Senate Race Redux - Divided Government When? In 2010 The Democrats will again have a structural advantage. 34 Senate seats will be contested. Of these, 19 are held by Republicans and 15 are held by Democrats. To retake the Senate, the Republicans would have to hold all their seats, and take more than half of the Democratic seats up for re-election. Obama and the Democrats would have to screw-up on a scale of how the Republicans screwed up in 2000-2006. They would have to pile up a record of corruption and incompetence in two years comparable to what the Republicans did in six. I won't say it is impossible, but it does seem unlikely. The best the Republicans can expect in 2010 is to either hold serve, not lose any more seats, not lose the filibuster, or pick up a couple of seats and narrow the Democratic Majority. In 2012 the Republicans will finally have a huge structural advantage in the Senate elections. Of the 33 seats contested, 24 are held by Democrats and 9 by Republican. From this distance, the Republican seats look safe, and after four years of One Party Rule by Democrats, the electorate may be ready for some changes. If the Republicans can pick up two seats in 2010, they will only need to take six of the 24 Democratic seats to regain the majority. DWSUWF stands by the overall thesis of that post, but a few things have changed. Time for an update. First, based on the completely insane deficit spending in the first six months of Single Party Democratic Rule, we now have an answer to the last bullet. We will be in very sorry economic shape by the 2012 election, with a debased currency, wild inflation, and eclipsed by China (or far along in the process) as the pre-eminent economic engine on the planet. The only question now is whether the continuing Single Party Democratic Rule will make it even worse. Second, there have been some changes in the structural elements of the 2010 Senate races. Republican Arlen Specter changed his party affiliation, and the Missouri race was finally decided. With Al Franken now in the Senate, there are 60 Senators who caucus Democrat and 40 Senators who caucus Republican. 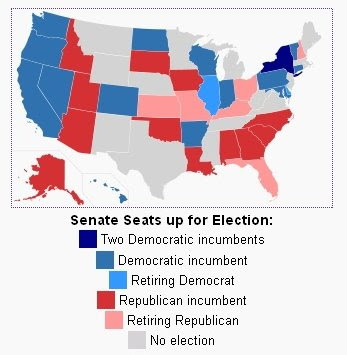 With special elections in New York to replace Hillary Clinton and in Delaware to replace Joe Biden, we now have 36 Senate seats up for grabs in 2010, with 18 held by Republicans and 18 held by Democrats. Perversely, the Republican hand in 2010 was strengthened by their unrelenting poor performance in 2008-09. Instead of defending 19 of 34 seats as outlined in my previous post, they are defending 18 of 36 seats, exactly like the Democrats, and on a structurally even playing field in 2010. They are in too deep a hole to have any chance of retaking the majority in 2010, but if they can take 2 or 3 seats, they will be in an excellent position to retake the Senate in 2012 when they will have significant structural factors in their favor. As such, DWSUWF believes that the Senate remains the best chance to divide this government in 2012. While Barack Obama's poll numbers have predictably eroded from the stratospheric level he enjoyed earlier in the year, he still has a deep reservoir of goodwill and personal popularity with voters. He is personable, likable, smart, and as Joe Biden noted - "clean and articulate". Predictions three years out are probably foolish but barring some as of yet unrevealed scandal close to the President, DWSUWF expects him to be reelected. This means the best chance to restore fiscal rationality in 2012 is for Republicans to take the Senate, and that will take two election cycles. A journey of a thousand miles starts with a single step, so lets get started. The first step is for Republicans to pick up a couple of seats in 2010. Two races have my early interest. Does Chris Matthews think birthers are a litmus test for the GOP? Pat Toomey's Senatorial campaign is DWSUWF's first recommended candidate contribution for the 2010 election and a link to his campaign will soon appear in the sidebar. Another campaign of interest - Democratic Senator Chris Dodd's Connecticut seat. This blog had some positive things to say about Chris Dodd during his brief presidential run. That was then. This is now. A lot of questions emerged about his close relationship with Fannie Mae and Freddy Mac, a sweetheart mortgage from Countrywide Financial and cozy relationships with banking lobbyists. Net net - This is a race that should be a slam dunk and a safe seat for Democrats, but is now up for grabs. Recent polls show that Dodd is trailing former Republican congressman Rob Simmons. Simmons would be a fine choice. But there is another interesting challenger in Connecticut. Money manager and financial soothsayer Peter Schiff is also considering a run for this seat. Your loyal blogger describes himself as a "libertarian leaning independent". There are few libertarian voices in our federal government, but they do exist, and they are beacons of clarity and integrity in the fog of Congressional rhetoric. During the 2007 Iraq funding debate, DWSUWF took note of speeches by Ron Paul and Jeff Flake as welcome examples of intellectual honesty and clarity. We could use a libertarian voice in the Senate. Peter Schiff could be that voice. I have no idea whether he has a chance, but he's got money, and I'd like to see him run. He certainly will make the campaign more interesting, as well as inject ideas into the national political dialog that otherwise may never emerge above noise level. I will be contributing to his "moneybomb" effort tomorrow and encourage like-minded DWSUWF readers to do the same. I agree with your prediction for the Senate in 2012 (which makes us both brilliant or foolish), but I think it's still too early to call on the Presidential front. There's no obvious Republican who could beat Obama right now, but 3 years is a long time. Still, the R's have to find someone who can raise over a billion dollars. Not easy. Lets go with "brilliant". I agree its too early on the Presidential race, calling it is a complete crapshoot from here. 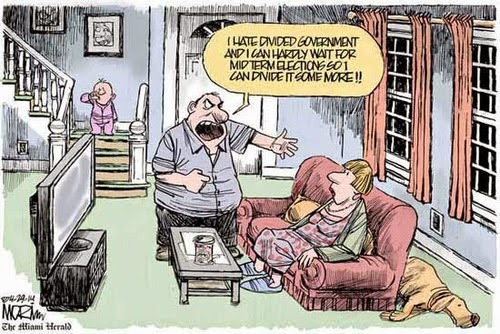 Winning the Senate is a much more predictable path to divide this government.